In the early morning hours of 11/12/16, Vernon Police and Fire units responded to multiple dumpster fires. Once extinquished, the fires were determined to be intentionally set. Surveillance video at one of the fire locations, captured two subjects in the area when the fire erupts. 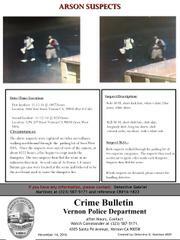 Vernon Detectives are asking for the public's assistance in identifying the subjects seen in the attached crime bulletin or anyone with additional information regarding the fires. Please see the attached crime bulletin and contact the Vernon Police Department at 323-587-5171 if you have any additional information that will assist in this investigation.